Vélo Vogue: [Dapper Lad Cycles] Hot Hosen! 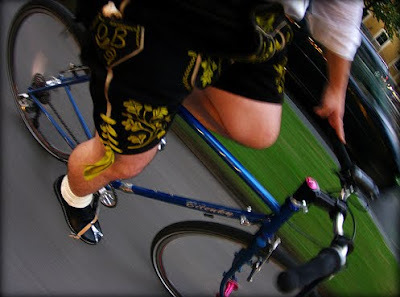 Lederhosen Panda by Dapper Lad Cycles. From Dapper Lad: For those of you following at home, I'm in Munich for work, and I've had the pleasure of making the acquaintance of Herbert from Lederhosenwahnsinn. In this photo Kim and I are riding our bikes back from Herbert's shop where he was hosting a "First Day of Oktoberfest" Party. 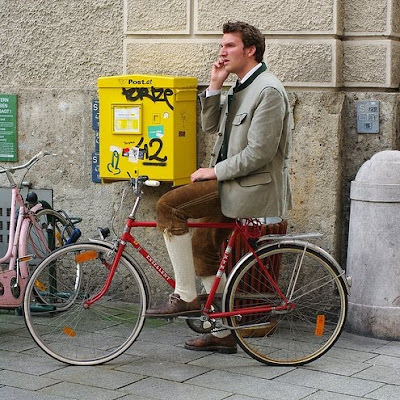 And here's my favorite, the Salzburg Cyclist. Photos and words by Dapper Lad Cycles. Believe it or not, this is very normal in Austria. People wear traditional costume as a form of formalwear, especially in summer, not to mention to attend the myriad of cultural events held in towns like Salzburg. Took me a while to get used to this when I was living there!